Designed by Lynn C. Thompson in conjunction with his fencing partners, Anthony DeLongis and Jason Heck, the 1917 Carbon Steel Saber's basket guard offers complete protection to the fingers and vulnerable thumb and when presented correctly, protects the user's hand, wrist, and forearm. The 1055 carbon blade of this saber is moderately curved with a short bevel grind and a long narrow fuller. To help protect it from rust, each blade is polished before being deeply blued to inky black perfection. When combined with a short, sharp, clip point, these features make for a very stiff, strong blade capable of delivering fearsome cuts and thrusts while shrugging off abuse that would break a lesser sword. It is 36" in overall length. So, I looked over this Sword a long time before finally purchasing it. I love the style and the strength. It's a seriously solid piece of steel. The basket-guard is huge and offers superior hand protection. However, that is also the problem. The guard is so wide that it doesn't fit in the scabbard, that is, the frog is built wrong. 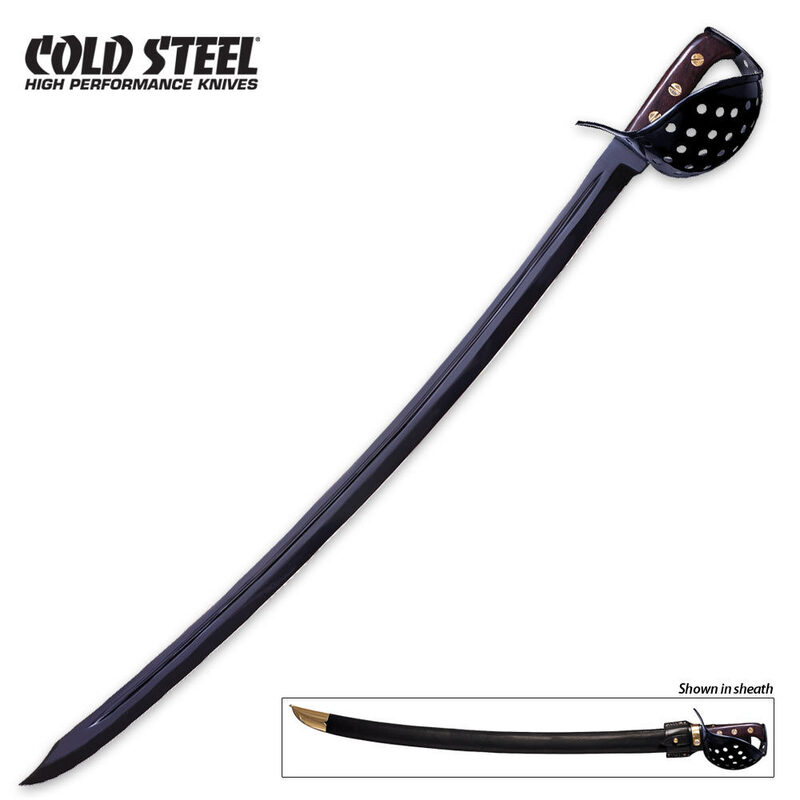 How did Cold Steel drop the ball on this? What a shame; to have put so much time and effort into such a beautiful blade and then not check to see if the scabbard could be attached to a belt and worn without jutting and twisting the leather to its breaking-point. Unfortunately I am going to return it and purchase a more usable blade. But, at least BUDK always ships it fast.